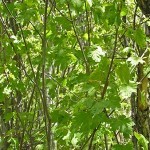 The Rocky Mountain Maple is a deciduous shrub, small dwarf tree or clump. 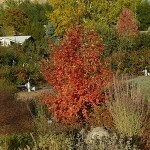 Very ornamental; dark red twigs, fruit tinged red, yellow fall color. 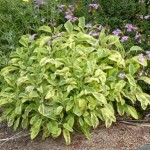 Drought and partial shade tolerance. Not currently available. The Big Tooth Maple is native to western North America, along streams from Idaho to Wyoming and south to Mexico. Brilliantly colored fall foliage. Lustrous green leaves, seeds emerge rosy-pink. 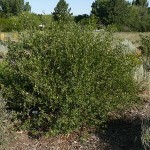 Shrubby in youth, rounded head at maturity. One of the most sought after inter-mountain native trees. 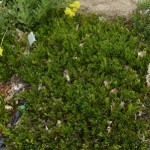 Kinnick-kinnick is a glossy deep-green groundcover that does well under trees and shrubs in full sun or part shade. Small pinkish blooms are followed in fall by bird-friendly red berries. Leaves green or deep red in winter. Height x Width: 6 in. x 24 in. Fringed Sage is a low growing sagebrush relative forming mats of frilly grey-green leaves, giving rise in summer to foot-high fringed seed-stalks. Trim off seed-stalks to maintain as an ornamental ground cover with good color year- round. 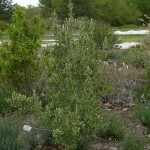 Height x Width: 3 ft. x 3 ft.
Mountain Big Sage is a more compact, tidy version of the common big sagebrush. 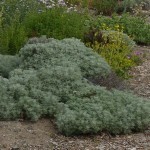 Grey-green foliage provides structure in the garden and winter interest. More info here. The keystone species in our native landscape. 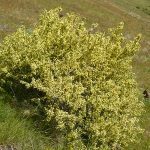 Big sagebrush grows at lower elevations and needs no water once established. It is the principal food and cover for sage grouse. More information here. 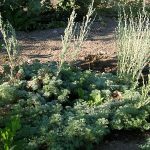 Curlicue Sage has frothy mounds of silvery leaves that provide four season texture and color-contrast to any xeric landscape. 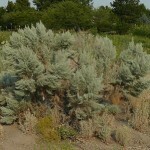 This delightful Asian sagebrush cousin will add structure and interest to a colorful border. 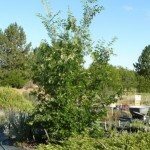 Height x Width: to 20 ft. x 20 ft.
Hackberry is a deciduous native tree, growing on rocky outcroppings on dry slopes in Southern Idaho. Often gnarly, graceful and sculptural in form. Great tree for small areas; orange berries loved by birds; Native Americans crushed and ate the fruit with parched corn. 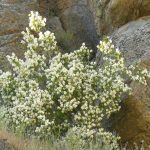 Height x Width: 10-15 ft. x 8-10 ft.
Mountain Mahogany is an attractive evergreen, large shrub to small tree with spreading open crown of thick, twisted branches and furrowed reddish brown bark This beautiful Owyhee County native will tolerate heavy pruning and is browsed into beautiful bonsai-like shapes in the wild. More information here. 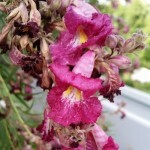 Desert Willow is a small tree with willow-like leaves and gorgeous iris-like flowers in mid-late summer. Attracts Hummingbirds! Tolerates clay. Not currently available. More information here. 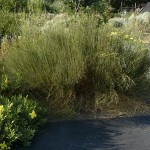 Mormon Tea is an evergreen shrub is native to the high desert of Nevada, Utah and other western states. The bare green stems are marked by the tiny brown ridges which are actually the plant’s leaves. Tolerates clay. Dramatic! Not currently available. 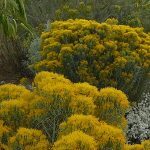 Height x Width: 2-6 ft. x 2-4 ft.
Rubber Rabbitbrush is a tough native shrub covered with brilliant display of golden flowers in fall. 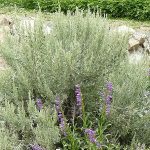 Its upright form and graceful silver foliage make it an ideal foundation plant in the xeric garden. Supports butterflies & birds. Needs good drainage. Pollinators: butterflies, small bees. Not currently available. More info here. 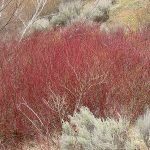 Height x Width: 3-5 ft. x 3-5 ft.
Apache Plume is a sturdy multi-branched southwest native shrub provides good bird habitat. 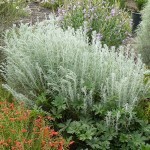 Small white, rose-like flowers emerge over a long blooming season and are followed by charming, fluffy seed heads. More info here. 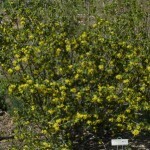 Lydia broom, a well-behaved flowering shrub, is a stunning sight in late spring,–covered with bright yellow pea-like flowers. Otherwise, the evergreen mound of wiry stems provide good structure year round. Tolerates clay. 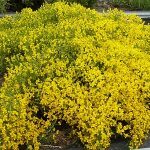 Don’t confuse with invasive Scotch Broom. Choice! Foamy waves of white flowers cover this native shrub in summer. Attracts butterflies and bees. Attractive in bouquets. More information here. 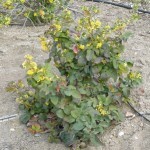 Similar to the more common Ocean Spray, but growing in hotter, drier conditions. It thrives in dry rocky desert valleys and hillsides from Idaho south to Arizona and New Mexico. Foamy waves of white flowers cover this native shrub in summer. 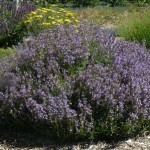 Supports native pollinators. 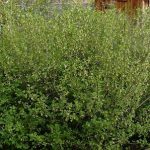 Winterfat is a low-growing, compact xeric shrub. 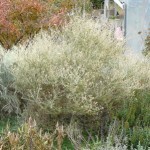 Produces tiny white flowers in summer followed by ornamental woolly white seed heads in fall. Exciting in dried arrangements. Attracts birds & tolerates alkaline soils. An eye-catcher. 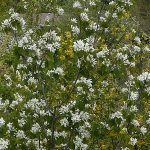 Height x Width: 4-10 ft. x 6-8 ft.
Syringa or Mock Orange is a deciduous shrub with lovely four petaled flowers, incredible fragrance. In the wild, Syringa grows in variety of habitats, from streambanks to lava flows. Can adjust to very low water sites. Idaho state flower. 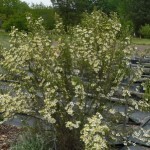 Chokecherry has profuse racemes of white flowers that turn into edible black fruit. Leaves turn deep glossy red in fall. Freely suckering growth form provides good wildlife habitat, especially for birds. Pollinators: butterflies, bees. 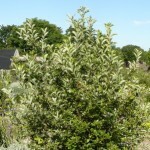 A stout, upright shrub or subtree growing to head-high or higher. Produces many pale yellow, wildrose-type flowers in the spring, each of which produces five feathery plumes with a seed attached. Related to bitterbrush. 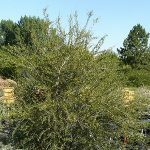 The Gambel Oak is a slow-growing large shrub to small tree., often forming a multi-stemmed thickets, Good accent tree with lovely fall color. Glossy leaves; interesting branch patterns in winter. Height x Width: 5-6 ft. x 6 ft.
Oakleaf Sumac is a dense, mid-sized to large shrub, excellent foundation plant. Yellow bloom in spring and nice orange-yellow leaf color in fall. Female plants can yield a tart fruit traditionally used to make a lemony drink. Deciduous. Good bird habitat. Unrelated to poison sumac. Height x Width: 18 in. x 36 in. 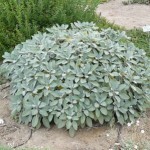 Berggarten Sage is a beautiful and distinctive cultivar or ordinary garden sage with huge leaves and few flowers. Excellent evergreen foliage and culinary plant. Tolerates clay. 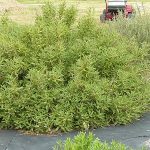 Height x Width: 6 ft. x 6 ft.
Silver Buffaloberry is an attractive mid-size shrub with grey-green foliage, similar to Russian Olive. It tolerates a wide range of conditions from wet and heavy to dry soils, but to keep growth under control, give very little water. Pollinators: butterflies, bees. Native to: West central U.S. This handsome yucca has narrow, evergreen, spiky leaves and sends up a tall stalk of fragrant white flowers in late summer. Likes full sun and well-drained, sandy loam. More information here.